Noah Wotherspoon performs as the crowd dances along on during the 2017 Big Bend Blues Bash. 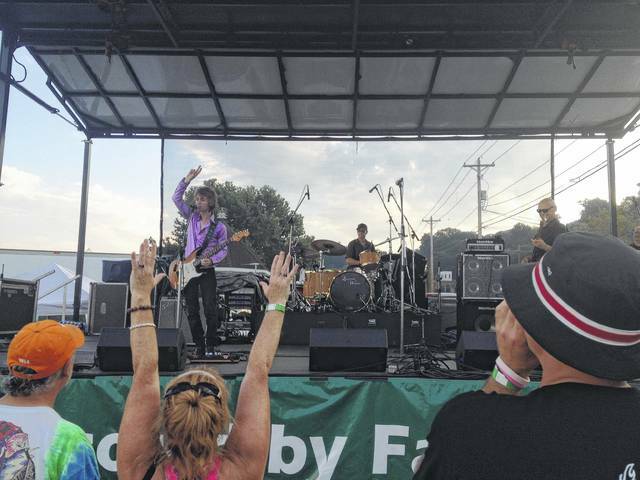 POMEROY — The Big Bend Blues Bash returns this weekend, bringing two days of musical entertainment to downtown Pomeroy. Music will kick-off on Friday evening at 6 p.m., with more than a dozen performers set to take to the stage Friday and Saturday. In addition, performances will take place at the Court Grill and Maple Lawn Brewery. On Friday evening on the riverfront Main Stage, the line-up will feature Snuggelfish at 6 p.m.; local favorites Blitzkrieg at 7 p.m.; the Sean Chambers Band at 8 p.m.; and Joanna Connor at 10 p.m. According to his biography, on March 17, 2017, Sean Chambers released his newest album entitled “Trouble & Whiskey” on the American Showplace Music label. Trouble & Whiskey hit No. 11 on Billboard, reached No. 7 on the Living Blues Charts during the first week of it’s release, and was nominated for a Blues Blast Music Award for “Best Blues Rock Album of the year”. Music on the Main Stage will begin at noon on Saturday with the Brent Patterson Showcase. At 1 p.m. will be the Napalm All-Stars; Blues Cowboys at 2 p.m.; Shouts & Whispers at 3 p.m.; Bernie Nau Trio at 4 p.m.; Rattlesnake Shake at 5 p.m.; Chris O’Leary at 6 p.m.; Lance Lopez at 8 p.m.; and Dwayne Dopsie & Zydeco Hellraisers at 10 p.m.
At the Court Grill, Rattlesnake Shake will perform at 10 p.m. on Friday, with Angela Perley & the Howlin’ Moons at 10 p.m. on Saturday. Additionally, the Maple Lawn Brewery Taproom will host live music on Saturday. The taproom line-up includes, Eric Buzzard at 1:30 p.m.; Corey Shields Trio at 2:30 p.m.; Brent & Barry at 3:30 p.m.; Band of Gypsys Tribute at 4:30 p.m.; Blackberry Jam at 5:30 p.m.; and Napalm All-Stars at 6:30 p.m.
One of the features of the annual Blues Bash is local craft beers. Featured this year are Sixth Sense Brewing Company, North High Brewing, West End Cider House, Devil’s Kittle Brewing and Maple Lawn Brewery. https://www.mydailytribune.com/wp-content/uploads/sites/42/2018/07/web1_Bash-5_ne2018726164447367.jpgNoah Wotherspoon performs as the crowd dances along on during the 2017 Big Bend Blues Bash.